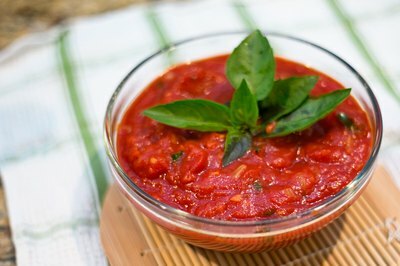 Tomato paste is a highly concentrated form of tomato normally added to other canned tomato products, such as tomato puree, crushed tomatoes and tomato sauce. As it is highly concentrated, it is added for flavor and to help thicken a sauce. 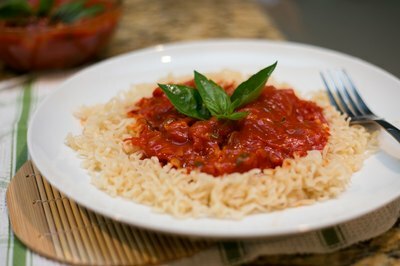 Tomato sauce can be used on its own to make a tomato sauce for pasta, and is prepared much in the same way as sauces made with other tomato products would be. 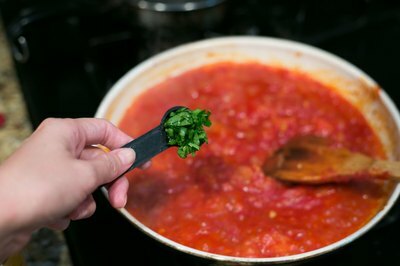 This recipe uses two six-ounce cans of plain tomato paste and makes a flavorful sauce suitable for pasta or as a cooking ingredient. Finely chop one quarter of a medium onion and one clove of garlic. Saute the onion and garlic in two tablespoons of cooking oil in a medium-sized sauce pan over medium heat for three to four minutes. 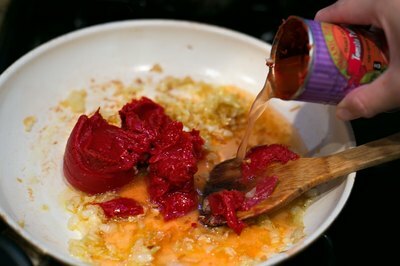 Add two eight-ounce cans of tomato paste and three paste cans of water to the onions and garlic. As the paste and water heat up, stir with a large spoon until blended. Lower the heat. Add one and one-half teaspoons of oregano or basil (your preference), one-quarter teaspoon of hot pepper flakes (if desired) and salt and pepper to taste. 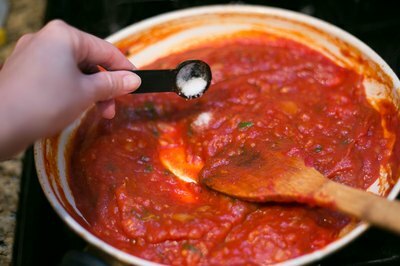 Also add one-half teaspoon of sugar, to reduce the tang of the tomato paste. Simmer on low heat for 20 minutes. Taste and adjust seasonings if necessary. Serve over pasta or use as a sauce for cooking. Always taste after seasoning. Seasonings can be added at any point during the cooking process, so start out with less, then taste to see if it needs adjusting more is needed. Saute one-quarter pound of ground beef with the onions and garlic to make a meat sauce. Be sure to drain the excess fat before adding the tomato paste.